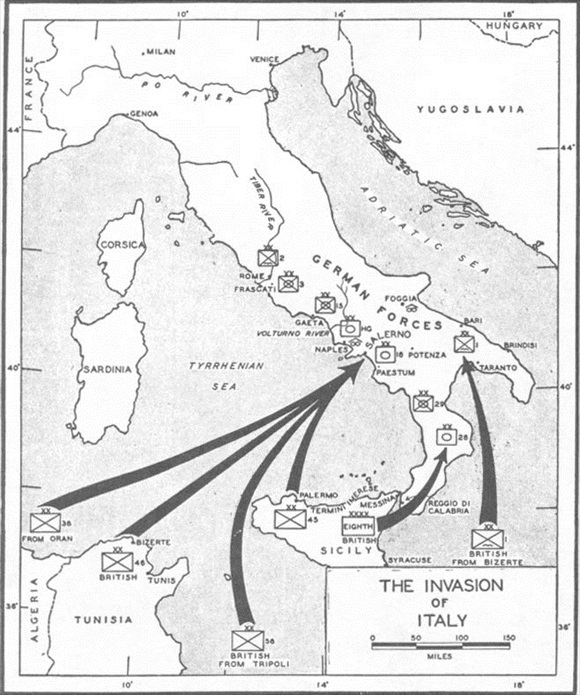 On this date in 1943 in Italy, the Allies from their strong­holds in North Africa and Sicily invaded the Ital­ian main­land at Saler­no south of Naples (Opera­tion Ava­lanche), with diver­sionary land­ings at Cala­bria (Opera­tion Bay­town, Septem­ber 3, 1943), which lay on the “toe” of the Ital­ian Penin­sula, and Taran­to (Opera­tion Slap­stick, Septem­ber 9), which lay in the “in­step” of the Ita­lian heel (see map). (A landing near the Ital­ian capi­tal, Rome, would have been too far from Allied air sup­port based in Sicily.) Allied bombing mis­sions during the first week of Septem­ber softened up the Salerno beaches and plain. In land­ing on the Ital­ian main­land U.S. forces were returning to the Euro­pean conti­nent for the first time since 1918. The day before the Saler­no assault, Septem­ber 8, both Gen. Dwight D. Eisen­hower, Supreme Allied Com­mander, and Marshal of Italy Pietro Badoglio, former Chief of Staff of the Ital­ian Army and now Benito Mus­solini’s replace­ment as head of state, publicly an­nounced Italy’s uncon­di­tional sur­render, though the two sides had negoti­ated sur­render terms five days earlier. Im­medi­ately, King Victor Em­manuel III and the Ital­ian high com­mand for­sook Rome for the safety of Bari, directly north of Taran­to. After Mus­solini’s fall from power the pre­vious July, Adolf Hitler had declared the Ita­lians to be the “bitterest enemy.” He directed his armed forces to take over the defense of Italy and occupy Rome, fun­neling fresh divi­sions from Austria through the Bren­ner Pass into Italy since the start of August—this as a resur­gent Red Army made gains on Ger­many’s East­ern Front. Three days later, on Septem­ber 12, Ger­man com­mandos snatched Mus­solini from Ital­ian cap­tivity high in the Apen­nine Moun­tains and set the Duce up as head of a pup­pet govern­ment in North­ern Italy, the Ital­ian Social Republic (Repub­blica Sociale Ital­iana). The in­va­sion of the Ital­ian main­land unleashed 20 months of con­fusing and mur­derous tur­moil in Italy between Axis and Allied armies and Fascists and anti-Fascists. On April 27, 1945, as Allied troops advanced through North­ern Italy, Ital­ian par­ti­sans cap­tured Mus­solini trying to escape to Swit­zer­land, exe­cuted him the next day, and hung his corpse, along with a half-dozen other Fascists, from the girder of a gas station in the Piazzale Loreto in Milan. Above: Breaching Hitler’s “Fortress Europe.” Once established on the Ital­ian main­land, the Allies hoped to secure com­plete naval and aerial domi­nation of the Med­i­ter­ra­nean, secure stra­tegic ports and air­fields for future opera­tions against For­tress Europe, knock Italy out of the war, and force the Ger­mans to retreat north of the Alps. Left: Lt. Gen. Mark Clark, Commanding General, U.S. Fifth Army on board USS Ancon during the landings at Salerno, Septem­ber 12, 1943. Clark’s con­duct of opera­tions through­out the Ital­ian cam­paign is con­tro­ver­sial, but Gen. Dwight D. Eisen­hower con­sidered him a bril­liant staff officer and trainer. 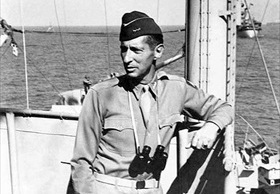 Clark won many awards, including the Distin­guished Ser­vice Cross for extreme bravery in war, subor­dinate only to the Medal of Honor. 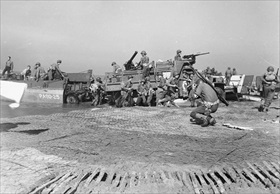 Right: Artillery being landed during the inva­sion of main­land Italy at Salerno, Septem­ber 1943. By sun­down on D‑Day, more than 50,000 Allies (out of a total of 189,000 on Septem­ber 16) were ashore and had pushed inland as much as eight miles. Their inten­tion was to cross the level Salerno plain, cross over the foot­hills to the moun­tain passes and through them to Naples, where they could use its port and air­fields as a base for future operations in Italy. Left: The Allies projected that the Germans might have 39,000 men facing them on D‑Day but on D+3 would have a force of 100,000. The Ger­mans suc­ceeded in placing mor­tars and artil­lery (like the one shown in this photo) on the high ground in a semi­circle covering the whole coastal area. On Septem­ber 13, “Black Monday,” Gen. Mark Clark’s Fifth Army, pinned down to a bridge­head, desper­ately tried clawing its way out of the jaws of defeat. By the next night the crisis had passed with the assis­tance of airborne reinforcements. Right: The Salerno beachhead was secured at the cost of 12,500 Allied casu­al­ties and MIAs on Septem­ber 16, 1943. On that date Gen. Ber­nard Mont­gomery’s British Eighth Army, moving up from the south, linked up with Clark’s Fifth Army. On Septem­ber 19 the Amer­i­cans pushed north­west towards Naples. 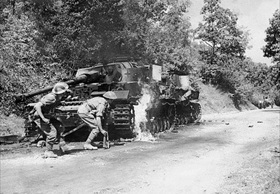 In this photo from Septem­ber 22, 1943, men of the 2/6th Queens’s Regi­ment advance past a burning Ger­man IV tank in the Salerno area. 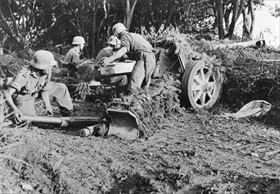 The regi­ment saw heavy fighting at Salerno, Monte Casino, and Anzio.